ELIZABETH CITY, NC –– Remarkable fuel efficiency, responsive handling, and ingenious technology make this 2016 Chevrolet Cruze Limited a smartly designed sedan. Many surprise features packed into the Cruze Limited can make tackling everyday life a cruise Learn more details by downloading the 2016 Chevrolet Cruze Limited brochure. The little details in the 2016 Cruze Limited are what make this sedan a stand out in its class. Drive Shift Control with the available 6-speed automatic transmissions allows you to switch from automatic to manual. The rack mounted Electric Power Steering and Z-link rear suspension make the 2016 Cruze handle like a poised, well-tuned sport sedan. The Cruze Limited offers a luxury feel without the luxury price tag through its hushed interior, exceptional passenger room, soft colors and leather appointed seats, and premium sound. The Cruze offers 60/40 split-folding rear seats to suit your needs. Not only is the Cruze flexible, but also efficient with up to 38 MPG in LT/LTZ, and up to 42 MPG in Cruze Eco. OnStar built-in 4G LTE Wi-Fi provides an incomparable connection experience all within the comfort of the Cruze’s cabin. 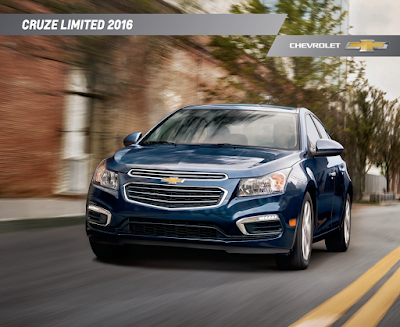 See all specifications in the downloadable 2016 Chevrolet Cruze Limited brochure. After you decide what convenient features you want in your everyday drive, stop by Perry Auto Group to purchase or lease your 2016 Chevrolet Cruze Limited. Perry Auto Group has two dealership locations to serve you better at 1005 W. Ehringhaus St, Elizabeth City, NC, 27909 or 1001 Halstead Blvd Elizabeth City, NC 27909. Stop in for any of your auto or community needs, or feel free to give us a call at (252) 338-9100.